As The Flowerpot Men, Ben Watkins and Adam Peters brought a dark edge to 80s synthpop. 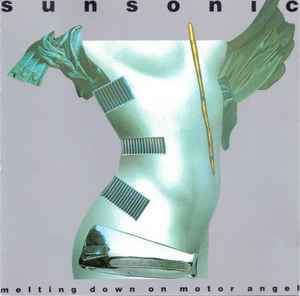 Upon signing to Polydor they changed their name to Sunsonic (presumably because there had already been a band called the Flowerpot Men in the 60s) and released a single album, Melting Down On Motor Angel (a Flowerpot Men track that did not appear on the album, oddly enough) in 1990, before they split up and Ben Watkins went on to become Juno Reactor. Melting Down marks the middle ground between the rock-influenced synthpop of the 80s and the full-fledged techno of the 90s. Yello, Beloved, Underworld, 90's-era U2... these are a few of the acts that this album brings to mind. A fusion of rock, pop, dub and house, it's an interesting album for 1990 - very much ahead of the game by a couple of years, I'd say. Flicking through the liner notes, you'll find Sam Brown on backing vocals, a thank you to Severin from The Banshees... and the singles packages issued to promote the album also offer some great dancefloor re-works from the likes of Youth, Oakenfold, 808 State, etc. Worth investigation should you stumble upon Sunsonic. 7/10. A lost gem of synthpop, with amazing Ben Watkins on vocals. Great stuff. great album. predated Underworld by a few years. combined excellently produced cinematic pop, ambient textures and full on dance grooves of the day. a lost classic. Ben Watkins was a great musician even before Juno Reactor by bewildered.